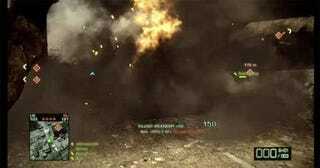 DICE blows up more stuff in Panama in the latest installment of Battlefield: Bad Company 2's Battlefield Moments. At first I thought this was the same Panama trailer that Luke posted back in December, but upon closer inspection it's obvious this footage and that footage are different. For instance, it's nearly a month later, and this video is a bit shorter. Okay, other than that the two clips are pretty similar, but you can never have too much footage of things blowing up, especially when it's this pretty.